Obituary for George Konstantino Galanis Jr.
Arnold Moore & Neekamp - Mr. George Konstantino Galanis, Jr., age 84, and retired longtime employee of Reda Pump Co., died at 11:24 PM on Wednesday, February 7, 2018 in the Heritage Villa Nursing Center, Bartlesville, following an extended battle with Parkinsons disease. Funeral services for Mr. Galanis will be held at 11:00 AM on Saturday, February 17, 2018 in the sanctuary of the First Church of the Nazarene. Dr. Randal D. "Randy" Schuneman and Mr. Stephen O. Colaw will be the officiants. The Ft. Sill Memorial Affairs Group, Ft. Sill, Oklahoma will accord him full military honors at the graveside. The Bartlesville Masonic Lodge #284 AF&AM will accord him Masonic Rites. Committal prayers and interment will be directed in the Galanis family plot, beside the grave of his wife, Bonnie L. Galanis in the Memorial Park Cemetery. Final rites have been entrusted to The Arnold Moore & Neekamp Funeral Home. 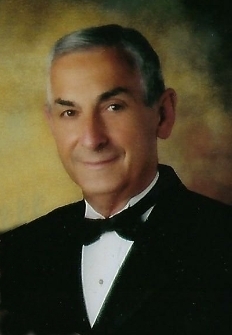 Mr. Galanis will lie in state in the Arnold Moore & Neekamp Funeral Home, 710 S. Dewey Ave., where friends may call for their visitation on Monday through Friday from 9:00 AM – 7:00 PM, until he is removed to the church for services and final rites on Saturday. Casket bearers for Mr. Galanis will include members of the Lambda Chi Alpha Fraternity, Stillwater, Oklahoma. George Konstantino Galanis, Jr. was born to a pioneer Washington County family on January 1, 1934 in Bartlesville. At the age of one day old, he was awarded the lifetime distinction of being named the first New Year's Baby in the New Year's Baby competition in Bartlesville. He was the son of the late George Konstantino Galanis, Sr. and Lena (Pomeroy) Galanis. His parents, George, Sr. and Lena were the co-owner/operators along with Louis B. "Uncle Louis" Galanis, of the Blatz Cafe', located at the corner of Third Street and Keeler in Bartlesville from 1921-1955. George, Jr. and his sisters, Elenia and Ella, worked at the cafe' before and after school, weekends and during the holidays during their youth. George was also employed by the Crystal Ice Plant as a deliveryman. He was reared and received his education in the Bartlesville community where he attended the Garfield Elementary School, Central Junior High School and College High School from which he graduated with the Senior Class of 1952. During his high school years, he was active in athletics and lettered in baseball, basketball and tennis. Throughout his life, George remained an avid tennis enthusiast. He also played baseball for the Doenges American Legion Baseball Team. He was active as the Captain of the College High Band and was an originator and drummer for the "Kings of Swing" and "Downbeats" dance bands. George continued his education at the Oklahoma A&M University, Stillwater, OK, now known as Oklahoma State University, where he served two terms as President of the Lambda Chi Alpha Fraternity. He was active in the Oklahoma A&M College Tennis program. While attending Oklahoma A&M, he received his commission of 2nd Lieutenant through the ROTC program in the United States Army Infantry. He graduated from Oklahoma A&M in January of 1957 with his Bachelor of Science Degree in Marketing. He later attended Columbia University Graduate School of Business in New York City. George and Bonnie Louise Dixon were married April 8, 1961 in Claremore, OK and they made their home in Bartlesville. George served with the United States Army Reserves from 1957 until 1965 and attained the rank of Captain. He received his Honorable Discharge from the Reserves in 1965. In 1957, he was employed with the Reda Pump Co. and during his longtime career with them, he served in numerous positions in Water Systems Marketing, including Water Systems Manager of Marketing. He served a term as President of the Water Systems Council and two terms as Chairman of the Manufacturers Division of the National Water Well Association. He remained with the local Reda Pump Co. through mergers with TRW, Camco and Schlumberger. Following 42 years of service connection, he retired from Schlumberger on June 30, 1999 as Marketing Manager of the Western Hemisphere. During his tenure of service with Reda/Schlumberger Co., he and Bonnie enjoyed many trips throughout the United States and abroad. Bonnie preceded him in death on May 23, 2011. During Bonnie's illness, George was faithfully by her side from daylight to dark everyday. Following Bonnie's death, George faithfully visited Bonnie's grave each morning and before he went to bed each night, no matter the weather. George continued his ardent interest in tennis, playing three times a week and faithfully volunteering at Heritage Villa Nursing Center where he volunteered for the Sunday morning church services until failing health in July, 2015. He was a fervent OU football fan. In the latter years of George's life, he commented, "I just want to live the rest of my life making other people happy and enjoying my family"...He also stated many times that of all the places he has visited throughout the world, Bartlesville is the best place he has ever been. He was a member of the East Cross United Methodist Church; a Thirty-Second Degree Mason, the Bartlesville Masonic Lodge #284 AF&AM, the Scottish Rite Bodies, Valley of Tulsa and the Wasano Shrine Club. He was a charter member of the American-Greek Community of Bartlesville, the Bartlesville Tennis Association and was a proud, faithful attendee of the Fellowship of Christian Athletes monthly luncheon meetings. George was a man who was both gentle, and kind...the very definition of a true "gentleman." Throughout the world, he was immediately liked and respected by everybody he met. He displayed a humble and generous personality. He had a very quick wit about him. He loved telling jokes and stories, a/k/a "Grandpa stories"---many from his past experiences and some were just made up. At times he would laugh harder than anyone at his joke or "Grandpa story"...no matter how many times he had told that same story or joke. He was a great man in every possible way and most importantly was faithful to his Christianity. He encouraged his family to promise to meet he and Bonnie in Heaven one day to live for eternity. During his life, George was honored to be asked by his friends to be in 27 formal weddings and served as casket bearer for 34 of his friends. George LOVED washing cars and mowing his and his friends lawns in the heat of the day! Bonnie & George were well known for their intricate Swing dances and was always delighted to come across music and a dance floor. Surviving are his one son, George Konstantino Galanis, II and wife Heather, of the Bartlesville home; two daughters, Pamela Anne (Loper) Clark and husband, Jerry, Rockwall, TX and Trina Gayle (Loper) Hedges and husband "Jim", Broomfield, CO; 10 grandchildren, Ryan Clark and wife Amy, Brandon Clark and wife Jody, Celin Ferren and husband Beau, Preston Clark and wife Sunny, Dr. Adam Milroy and wife Rhonda, Tyler Milroy and wife, Dr. Laura Milroy, Marci Bach and husband Garrett, "Jimmy" Hedges, Ashley Hedges and Andrew Michael George Konstantino Galanis; 11 great-grandchildren, Lindi Jones, Landon Clark, Emily Clark, Taylor Clark, Colbie Clark, Silas Ferren, Kate Ferren, Kaitlyn Bach, Brooklyn Bach, Brayden Milroy and Jack Smith; one sister, Elenia Sophia (Galanis) (Campbell) Heflin and husband Jack, Tulsa, OK; one brother-in-law, Jerry Overfield, Tulsa, OK; three nephews, George Campbell and wife Sharon, "Chuck" Stead, Jr. and wife Cindy and George Stead and wife Pam; one niece, Gena Jenkins and husband Ted; two sisters-in-law, Colleen (Dixon) Baker, Bartlesville, OK and Deloras (Dixon) Johnson, Bartlesville; other special relatives and friends including, Bob, David and Jim Pomeroy, Lee Cockerell and wife Priscilla and Jerry Cockerell and wife, Gail, Jacqie Feil, Pat Pemberton, Elaine and Richard Hintze, Brad and Ginger Johnson, Calveta (Lucas) (Baker) Lyons and husband Rev. Willard C. Lyons, Jr., Bruce A. Lee, David Norvell, Dallas Dobbs, H. T. "Tom" Sears, Jr., Toly and Karen Arutunoff, Jim, Joan, Wayne and Lynette Quillin, Sally Frakes, Shirley and Bob Havens, Wayne McCollough, Dorothy and J.A. Murrie, Rick and Sue Maddox and Raymond and DeeDee Standridge, Mary Burdett and “Butch” Eulitt, Dean and Cathy Zervas, Steve and Debbie Neece, Dean and Brenda Coppedge and the Heritage Villa Nursing Center family; Elder Care Daybreak family and the Arnold Moore & Neekamp Funeral Home family. George was preceded in death by his wife, Bonnie Louise (Dixon) Galanis on May 23, 2011; father, George Konstantino Galanis, Sr., on June 25, 1954; mother, Lena Pomeroy Galanis on September 12, 2000; sister, Ella B. (Galanis) Overfield on June 24, 2000; cherished aunt, Ella Pomeroy Cook; uncles, Joseph, Loren and Floyd Pomeroy and Louis B. Galanis and dear friend, Patricia K. "Pat" (Cassidy) Lee. Also preceding him in death are his mother-in-law, Odessa C. "Dess" Dixon; father-in-law, Roy Vern Dixon; aunt, Avis Hobson and husband "Uncle Harold"; brothers-in-law, Carl Johnson and Carl Marvin Baker, Sr. and one nephew, Carl Marvin Baker, Jr. In every way imaginable, George was a good man who is now in a far better place. To send flowers to the family of George Konstantino Galanis Jr., please visit our Heartfelt Sympathies Store.